This was one of several churches in north Norfolk built during the second half of the 19th century to replace a medieval church. The case here is slightly different, because this one was built to replace two churches, those of East and West Beckham. It was built on a new site, in the middle of the village of West Beckham. The Beckhams are, for obvious reasons, rather difficult villages to look up on the internet, and in any case this is not a major church, or the work of a major architect. But the village is lovely, as they all seem to be around here, and we approached it along high hedged lanes on one of the first really bright, warm days of 2008. I shall always remember it for that. The church is possibly unique in one respect noted by Pevsner, because it is not only shingled on the outside, it is shingled on the inside as well. It is said that building materials were brought from the old churches, but in all honesty this is hard to see. Only the lower part of the chancel arch appears to be old here, although I did wonder about the tracery in the east window. At the west end is a clear rose window, and below it the font is like a crisp little wedding cake. The shingle of the walls is banded with red brick in the approved Puginesque style, and the interior is stunningly clean, obviously well-loved and looked after. On the upper banding, evangelical texts now more than a century old are fading, but still a touchstone to the recent past. In a nave window are parts of a medieval Holy Trinity shield built into modern glass. Trinity shields were designed to enforce Catholic orthodoxy in the second half of the 15th century, consisting of labels representing the three parts of the Trinity, and the relationships between them. However, some of the labels are missing here, those of God the Father and God the Son, as well as the relationship ribbon between the two. This has the unfortunate result of looking like the unusual theological position of some obscure pentecostal sect, although I'm sure that is no reflection on the liturgical tradition of this charming little church. Like the vast majority of churches in this area, St Helen and All Saints is open every day. You might think that this is no big deal, because this is not an important historical building, and there are few survivals of the past to explore. But that is not the point. 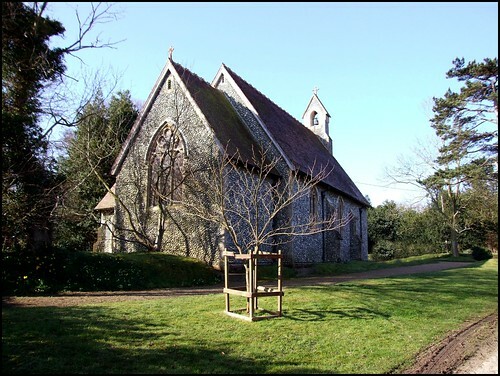 The parish churches are the greatest single act of witness which the Church of England possesses, and to find little churches like this open throughout the secret narrow lanes of north Norfolk is to be aware of the presence of a living Faith, and to enter into a sense of the numinous. The people of this parish are doing the work of God, simply by opening up to wanderers and pilgrims. Opening up a church to casual visitors is an easy act of simple human kindness. Like smiling at strangers, or not shopping at Tescos, it is a little thing. But it helps to make the world a better place.